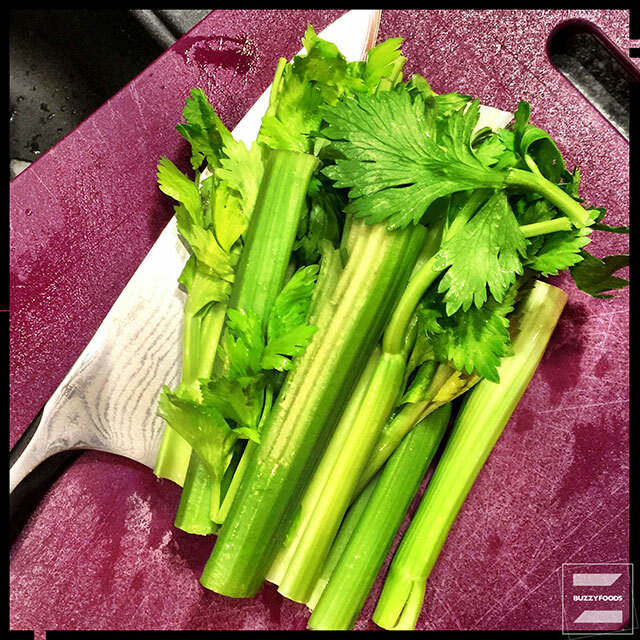 Invite a hint of Thanksgiving to your dinner table 0 without all the family squabbles or the stringy celery (yes, that was a major bone of contention one holiday between two ladies of a certain age, and the lady who was accused of not properly preparing the celery was not amused). the recipe (I am sorry, I didn’t note where I came across it) calls for shaping the stuffing mixture into 1/2 cup sized balls, and, man! 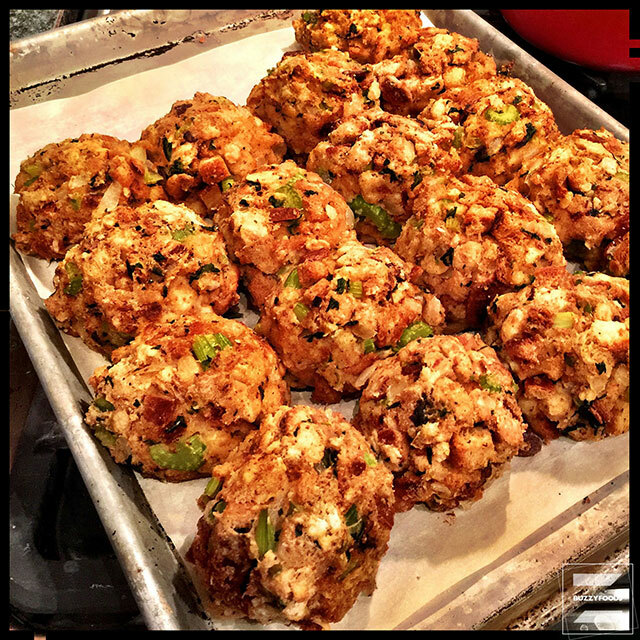 that is a lot of stuffing ball to put on a plate. Next time, and I am gonna make these again, I plan on cutting the portion down to 1/4 cup – and mebbe also adding a pound of cooked and crumbled breakfast sausage to the mix. *Use home made biscuits, from scratch or a mix; the biscuits from the tube at the market won’t work with this recipe. Note: MY biscuit crumbles only measured about four cups, so I thought it a GOOD thing that I had bought a 14 ounce bag of stuffing. Crumble the biscuits on a parchment lined baking sheet and pop into an oven warmed to 200º for two or three hours, until they a very well dried and a bit crispity. 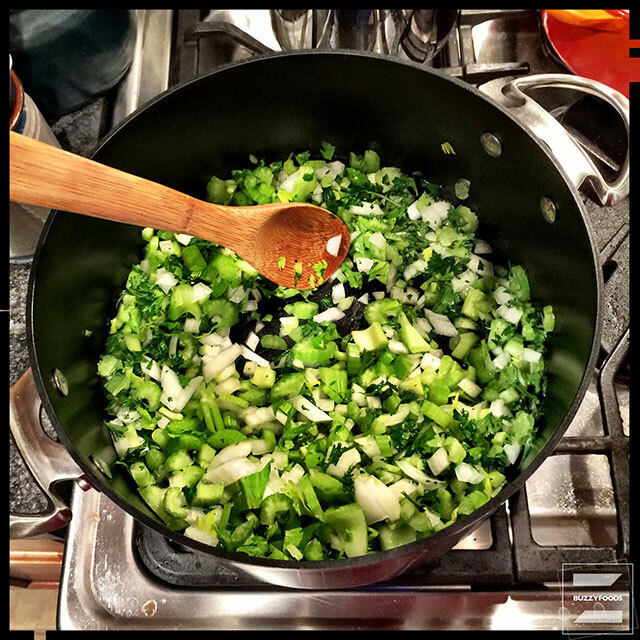 Melt two tablespoons of the butter in a large pan over medium heat, then add the onion, celery, and parsley and cook until the veggies are tender, about ten minutes. Transfer the veggies to a large mixing bowl or roasting pan and set aside to cool. Add the remaining butter to the pan, then add the chicken stock and bacon jam, stirring over medium heat until the butter is melted and the bacon jam is dissolved. Give it a taste, then add the salt, peppers, and garlic powder, if you think it needs it, and set aside to cool for just a bit. 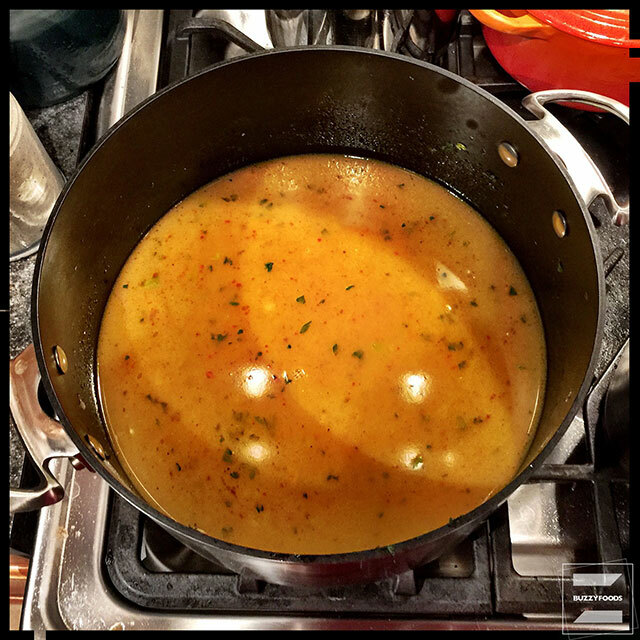 Note: when I made this batch, I used one tablespoon of coarse sea salt when I made the stock mixture, and Rich thought it a touch on the salty side, so I cut back the measurement to one teaspoon here. Stir the stuffing mix together with the crumbled dried biscuits and the cooked veggies in a large mixing bowl or – and this worked a treat here! – your large roasting pan. Pour the slightly cooled stock mixture over the stuffing, biscuits and veggies in the pan, give it another stir to get everything moistened, and set aside to rest for ten or 15 minutes. 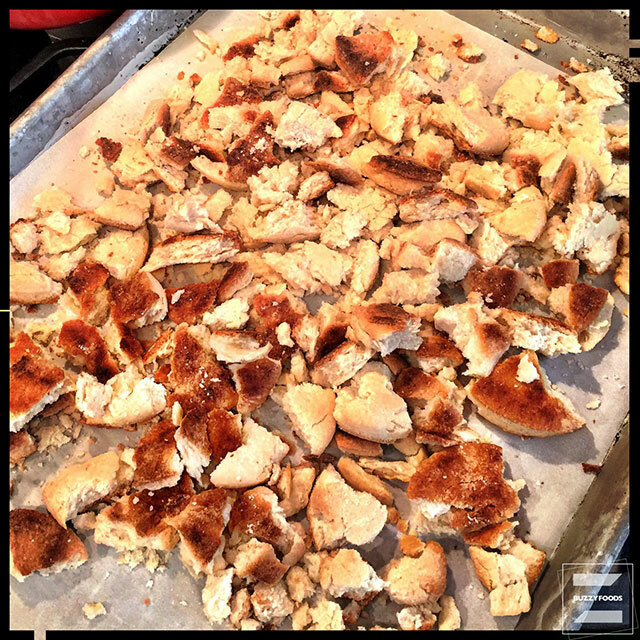 Heat your oven to 350º and line a baking pan with parchment paper. 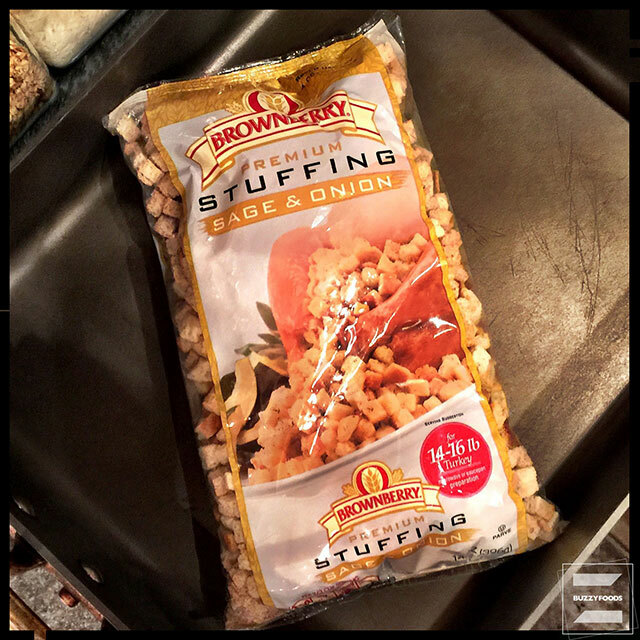 Scoop up one measure of your stuffing – recall that the original recipe called for one half cup, and I think that was a bit too much; try for one quarter cup – then shape it into a ball and arrange on the parchment lined baking sheet. Repeat with the remaining stuffing, arranging the balls so that they are touching as shown here. I got 17 1/2 cup sized balls, so you could plan on 34 1/4 cup sized. 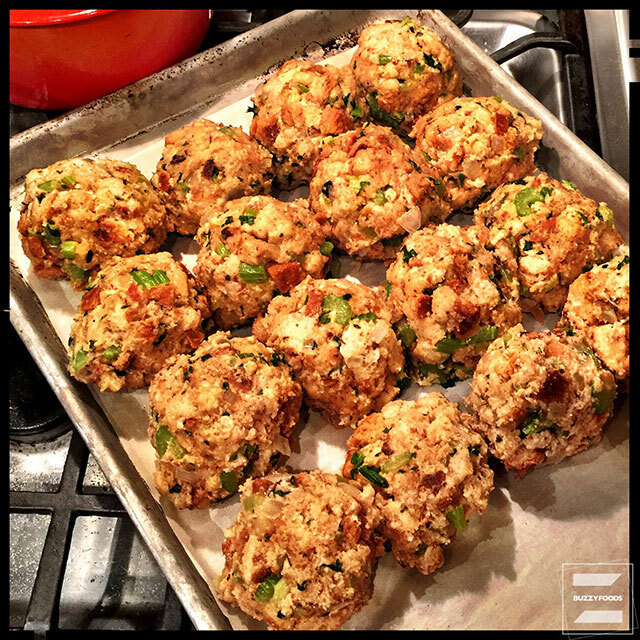 Pop the stuffing balls into the hot oven and bake for 30 minutes. Serve hot with fresh gravy (details to come) and mebbe some fresh chopped parsley over the top. 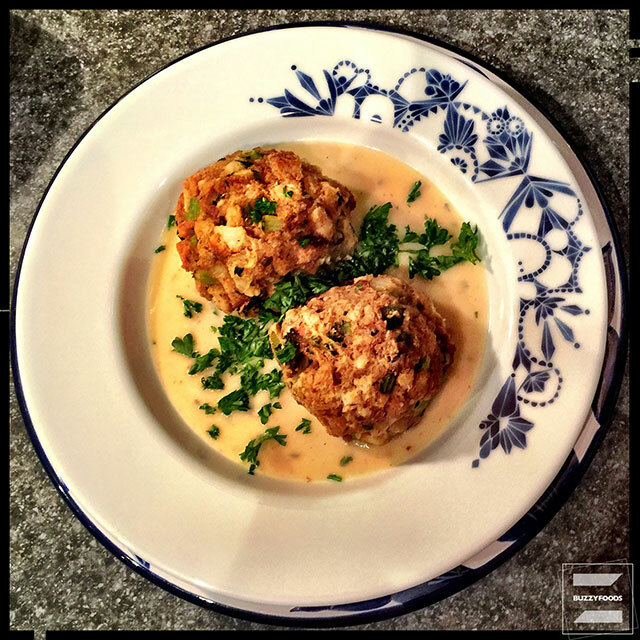 The stuffing balls come out nice and crispity on the outside, moist and flavorful on the inside; and I am thinking the smaller measure might make a fun party munchie, speared with toothpicks and the gravy as a dipping sauce. 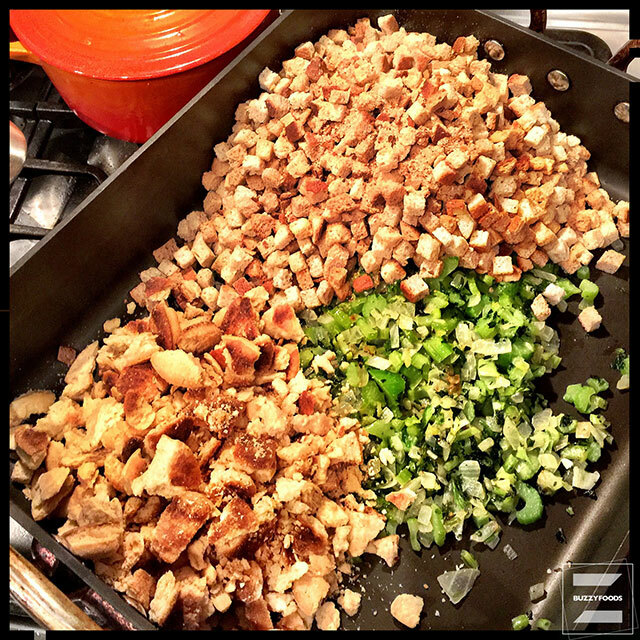 This entry was posted in Appetizers/Munchies, Bread/Pastry and tagged Biscuits, butter, Celery, Chicken Stock, onion, Stuffing, Stuffing Balls, Stuffing Mix. Bookmark the permalink.